You’ve seen the finish a thousand times, and for Matt Serra, it probably feels like he’s seen the ending of his UFC debut against Shonie Carter a million times. But what is lost when discussing Carter’s spinning backfist knockout of Serra at UFC 31 is that the previous 14:51 seconds of the bout contained some of the best back and forth action seen in a UFC fight before or since, and that if Serra would have been able to get up from the second spinning backfist he took (he was also rocked by one in the opening round), the final decision was up to debate and he could have walked away with a win. Regardless, Serra, even in defeat, defined himself as an aggressive and talented competitor who would always come to fight. Following the loss to Carter, Serra bounced back with a tough decision win over Yves Edwards at UFC 33 but in his next bout six months later he was obviously looking to score his first finish in the Octagon against unbeaten newcomer Kelly Dullanty. Well, he got it, attacking from the opening bell and putting Dullanty through Jiu-Jitsu 101 as he moved effortlessly from a rear naked choke to an armbar to a final triangle choke finisher to end the bout at the 2:58 mark. Sure, Serra was scrappy, but his jiu-jitsu was also world-class, something he put on display for the world on March 22, 2002. In Karo Parisyan’s five previous UFC fights, it’s hard to recall him ever being as hurt as he was in the early stages of his bout against Serra, who planted him on the canvas with a right hand seconds into their UFC 53 bout. Parisyan got up and instinctively fought back, but Serra opened up with both hands, seemingly seconds away from a stoppage victory. It didn’t happen, Parisyan got his legs back, and by the end of the round he was in control of the bout against a fatigued Serra, who went on to lose a three round unanimous decision. Serra wouldn’t return to the Octagon for over a year, and when he did, it was as a member of The Ultimate Fighter season four cast. But when he did come back, it was clear that he learned many lessons about striking discipline and conditioning. What he didn’t have to learn was toughness, which he showed in abundance as Parisyan turned up “The Heat” on him in rounds two and three. Those of us who had covered Serra from his UFC debut knew that he was a true New Yorker, a guy who talked loud but had a heart as big as his mouth. We also knew that if the rest of the country got a dose of him, they would love him. 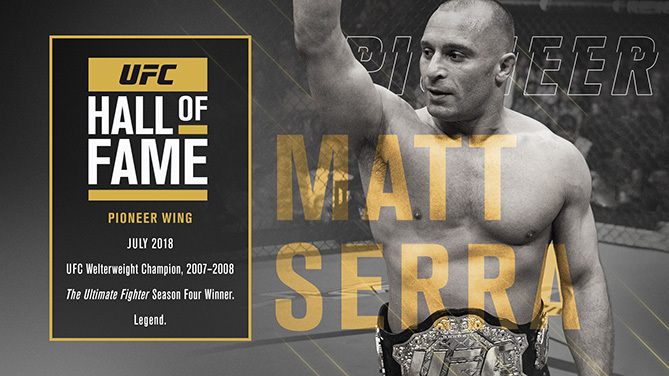 That’s what happened on season four of The Ultimate Fighter, when Serra brought his particular brand of charisma to a national television audience on a weekly basis and soon developed not only a huge fanbase, but an added level of respect from his peers on the show, who were the beneficiaries of his coaching during the six weeks in the TUF house and gym. And who will ever forget his dressing down of grappling coach Marc Laimon, a memorable moment from the series that gained him even more fans in and out of the fight game. It wasn’t pretty, it wasn’t exciting, and it was far from Serra’s best performance, but in terms of career importance, it’s hard to find a fight bigger than the Long Islander’s three-round decision win over Lytle, a victory that not only won him the TUF4 crown, it got him a title shot against Georges St-Pierre. And ironically, for a guy who never seemed to get any of fortune’s light shining on him in terms of close decisions (Penn, Din Thomas), having this close one go his way was perhaps an omen of good things to come just five months later. If you listened to pundits and fans before this fight, Serra didn’t even need to show up against the ultra-talented GSP, whose reign was expected to last as long as he wanted it to. All this did was fire up Serra, who went into the bout with no expectations on him, and thus, no pressure. The result? He came out loose, confident, and ready for war, and when he tagged St-Pierre and took his legs out from him, he wasn’t the wild swinging brawler that exhausted himself against Parisyan. Instead, Serra picked his shots as St-Pierre stumbled in an effort to get his legs back, and landed practically all of them until the bout was halted at 3:25 of the first round. There was a new UFC welterweight champion, and his name was Matt Serra.